your Short Sale business into the STRATOSPHERE?" Are you doing a couple deals a year? A few deals a year? One deal a month? How would you like to be doing 3 deals a month? How about 10 deals a month...Perhaps 20 deals a month? Believe it or not, IT'S ALL POSSIBLE! ARE you prepared to do multiple deals each month? DO you have a specific PLAN OF ACTION? DO you have SYSTEMS in place to handle 5...10...15 Deals a Month...month after month? IS your office and team set up and prepared to manage all the moving parts? DO you have the CASH or Investment Partners to close 2...3...5 deals at a time? DO you have the MINDSET and ATTITUDE it takes to grow and EXPLODE your business? ARE you ready to create MASSIVE WEALTH for yourself and your family? If you are, then this program is for you! This is the ULTIMATE 6-CD audio program on Building a lucrative and successful preforeclosure business. I take you step by step on HOW to build a short sale buying machine by teaching you HOW to set up your BUSINESS. This is the course I wish I had when I was starting my real estate investment career. Had I had the information in this program, I'd be years ahead of the game. One of the things nobody teaches you is what to do once you start closing deals. You're literally left to figure it out all for yourself. Wasted hours and money thrown down the drain because no one was there show you how to set up your real estate office or how to surround yourself with the right people. Lost deals because you didn't have the cash to fund your short sales. 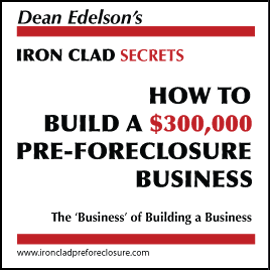 "How to Build a $300,000 per year Pre-Foreclosure Business"
spells it all out for you in great detail. There's no guesswork involved. You get SPECIFIC steps and courses of action to take to run and jettison your short sale business to new heights! How to get people to work for you FOR FREE! Do you want to know HOW to run a short sale or real estate business the RIGHT way, or the HARD way? Take it from someone who started off doing it the hard way...on his own. I've made the mistakes, I've spent the money, I've wasted countless, precious hours trying to do it all and figure it out all by myself. It was a great learning experience, but I wouldn't want to repeat it. And now you have the luxury of learning from my mistakes. I'll even tell you about some of them. More than some, in fact. Mistakes made by just about all beginning...and even experienced...entrepreneurs. Why would I do this? So you can see that what I do is REAL. And that what I talk about is REAL. It's not pie-in-the-sky theory, it's not something I learned from a book. This program is about EXPERIENCE and APPLICATION. It's HOURS of practical, down-to-earth, put-it-into-practice information to get your business going in a streamlined, time-saving, money-saving way. Start your short sale business on the right foot. Get your company up and running in no time. Get your systems in place so you can spend more time focusing on the MONEY PRODUCING activities instead of the MONEY WASTING activities. "How to Build a $300,000 / yr Pre-Foreclosure Business"
SUPER-CHARGE your Short Sale business! It's packed with countless hours of tips and instruction on how to build a lucrative business that will practically run itself on automatic pilot. Start Building your Business NOW! Even if you already have a business up and running, you'll find loads of distinctions and refinements PACKED onto each and every audio CD. If there's one suggestion I could offer to you, it's GET STARTED NOW on the path to financial freedom. This program teaches you how to focus, how to create a plan of action, what systems are crucial to succeed, how to build an AMAZING team to help you succeed, and how to create an office environment and hire staff that will LOVE coming to work each day...eager and hungry to help you MAKE A FORTUNE! There's No Other Course Like This Anywhere! Don't wait. Don't hesitate. Set your company up right the first time. It's much easier than going back and correcting the mistakes. Ask me how I know. ...contains everything you need to know to amass your real estate riches by building your empire with less hassles and fewer roadblocks. Whether you do short sales full time or part time, I'm confident this course will drive your returns through the roof! This 6-CD set is being offered at the special low price of only $397. This is a truly modest investment to get your business in high gear right out of the gate. And to show you how confident I am that this program OVER DELIVERS on content, tips, and valuable can't-do-without information, I'll give you a 30 Day No-Questions-Asked Money Back Guarantee! Listen to the CD's. Take them for a test drive. If you don't think the information is valuable, send it back and I'll refund your money. Order your copy of "How to Build a $300,000 / Yr PreForeclosure Business" TODAY for only $397. © 2006 Iron Clad Real Estate. All Rights Reserved.